“When humans visit Mars, they'll have to watch out for towering electrified dust devils”. 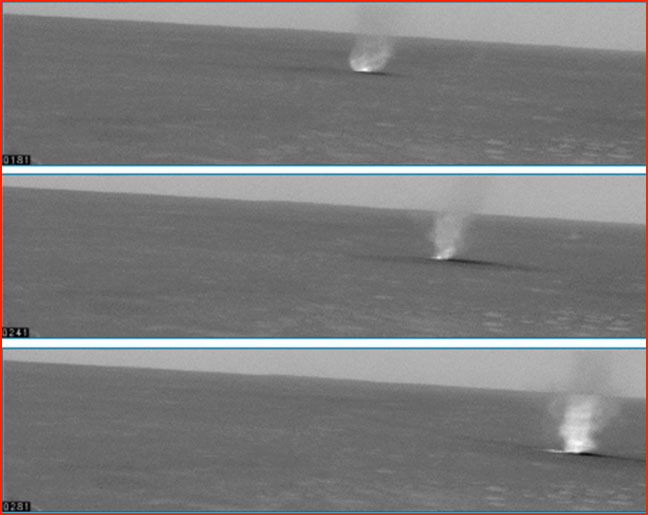 A good indicator of electrical discharge from ground to air within a Martian dust devil can be seen in the frames of a movie taken by the rover Spirit as the vortex spun across Gusev Crater just before noon on March 15, 2005. The luminosity of the apparent discharge activity at the base is compelling and confirms the earlier claim of Electric Universe advocates that the dark tracks left by the tornado-like whirlwinds on Mars are due to electric discharge. The NASA release described a typical dust devil on Mars as a “monster column towering kilometers high and hundreds of meters wide, 10 times larger than any tornado on Earth”. Were an astronaut to come face to face with such a monster he would encounter “red-brown sand and dust whipping around faster than 30 meters per second (70 miles per hour)” as visibility dropped to zero. And the “scariest part” would be the incessant crackling and flashing of miniature lightning, the article reports. Wallace Thornhill and others have proposed for at least a decade that dust devils, tornadoes, and waterspouts are electric discharge phenomena. See “ Electric Dust Devils."] The electrical theorists urge NASA researchers to drop once and for all the long-standing and unsupported dogma of an electrically neutral solar system, which has prevented meteorologists from seeing the larger role of electricity in weather phenomena on all planets, and even on the Sun. Scientists exploring Martian dust devils are forced to locate the “cause” of the electrical discharges in solar heating and the resulting mechanical energy of air convection. But in the Electric Universe, rotating columns of air are a natural consequence of atmospheric electric discharge. Rotating columns are the prevalent forms taken by electric currents in plasma. A researcher unaware of the global circuitry involved will be limited to mere discussions of localized charge separation. Effect will be confused with cause. Charge separation will be attributed merely to the physics of dusty air circulation within the vortex. But from the electrical vantage point, the dusty vortex itself is caused by charge exchange between the Earth and the solar plasma. The towering dust devils on Mars help to force the issue because they are too big and too powerful to be explained by the popular idea of mechanical charge separation. The NASA release suggests, “Dust devils get their charge from grains of sand and dust rubbing together in the whirlwind. When certain pairs of unlike materials rub together, one material gives up some of its electrons (negative charges) to the other material … Smaller dust particles tend to charge negative, taking away electrons from the larger sand grains”. In this view, the rising central column of hot air that powers the dust devil carries the negatively charged dust upward and leaves the heavier positively charged sand swirling near the base. In this way, the charges get separated, creating an electric field. But such an internal electric field, according to Thornhill, operates to prevent further charge separation. The convection process may be sufficient to trigger a larger scale discharge, but that requires an external field for the dust devil to grow to the size and power observed. On Earth the vertical electric field at sea level on a dry day is approximately 100 volts per meter. Orthodox models of the Earth and its atmosphere offer no realistic explanation for this field. 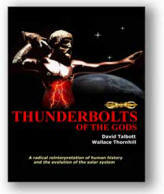 Thornhill claims that at Mars’ distance from the Sun, the lack of energy from the Sun, in combination with the extremely rarified atmosphere of the small planet, prevents atmospheric movement from generating the required charge separation without the existence of a global atmospheric electric field. The atmospheric pressure on Mars is only 1 percent that of Earth at sea level. Thus, a simple mechanical model, drawing on nothing more than mild warming of the Martian atmosphere, cannot account for the Everest-sized dust devils and global dust storms. After all, the global dust storms on Mars only serve to reduce solar heating at the surface. For the electrical theorists, giant electrical vortices on Mars are expected because there are insufficient water clouds to provide an intermediate electrical path from the ionosphere to the surface through normal lightning – as we find on Earth. The discharges that drive the dust devils on Mars have more in common with the “sprites” and “jets" phenomena recently discovered in the rarified atmosphere above earthly thunderstorms. In this view, the intensity and number of dust devils will be affected by solar outbursts and the planet’s elliptical orbit. Mars is moving radially to an appreciable extent through the electric field of the Sun. And this movement is sufficient to generate electrical events on a scale and frequency that would not occur if Mars were on a more perfectly circular orbit. If the electrical researchers are correct, the issue of dust devils on Mars cannot be resolved without addressing a bigger picture. Electric discharges can do what a rarified atmosphere cannot do—scorch dust black, raise dust into rotating vertical columns, generate global dust storms enshrouding the planet, and suspend large volumes of dust in the atmosphere.